Nuts&Fruits is an excellent choice if you like tasty and delicious snacks that are rich in nutrients. It is a great protein source that contains many different seeds and fruits. They have a high content of fibre and protein. In addition, they also contain vitamins, selenium, magnesium, iron, zinc and phosphorus in an optimal ratio. It contains a lot of polyunsaturated fats. It is an important source of Omega-6, manganese, copper, magnesium, vitamin E and vitamin B2. Fruits are an important element of a health-conscious diet. They are not only natural vitamin sources, but they are also very rich in fibre, magnesium, iron, calcium and other minerals. Nuts&Fruits offers the perfect combination of oilseeds and delicious fruits. If you would like something sweet as honey, try our new Nuts&Honey bar. Need a quick source of energy. Do you want something quick before your exercise? You have an alternative to banana, if you want something different. Oilseeds, fruits and fibre are excellent pre-workout energy sources. 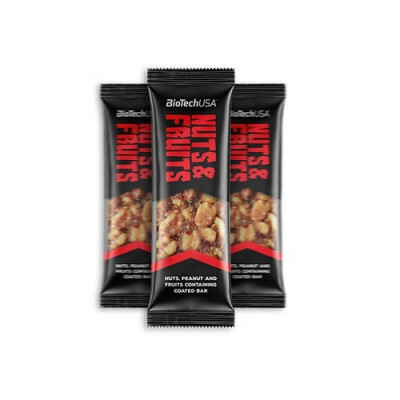 The peanut and almond of the Nuts&Fruits bar are a popular choice not only because they have a high protein content, but also because they contain significant amounts of polyunsaturated fatty acids. Oilseeds are a good match with the cranberries and pineapple added to the bar. The whole experience is topped of with the chocolate coating. It is not only the taste, but the texture is also important. This bar is crunchy from the added whole wheat flour of extruded cereals. This is a complex product in terms of macronutrients. In addition to being a great source of useful fats (unsaturated fatty acids from oilseeds) and carbohydrates (dietary fibre, fruits), Nuts&Fruits is also an excellent protein source. Like all BioTechUSA products, Nuts&Fruits consists of safe and carefully selected ingredients. Peanut pieces 45%, coating 15% (sugar, fully hydrogenated palm fat, fat-reduced cocoa powder, skimmed milk powder, lactose, emulsifier: lecithins,flavouring), fructose syrup, glucose syrup, cranberry component 7% [cranberries 65%, sugar, sunflower oil, elderberry juice concentrate, acidity regulator (citric acid)], dried pineapple 5% (pineapple, antioxidant: sulphur dioxide), extrudedcereals (wholegrain wheat flour, wheat semolina, rice, sugar, salt), almond pieces 2%, dextrose, emulsifier: lecithins. May contain traces of other nuts, sesame and eggs.